Start your studies with a foundation year to develop your skills before studying computer science with a strong emphasis on the practical programming skills needed for games development. Whether you are interested in developing games for entertainment or for serious applications, our BSc (Hons) Computer Games Programming will take you to the next level with your career plans. Our foundation year route will also give you a solid platform for success. You can also take the BSc (Hons) Computer Games Programming without a foundation year. Find out more. This dynamic course equips you with both the theoretical grounding and the practical skills you need to develop compelling computer games. Taking a foundation year first is an ideal choice if you have the potential and ambition to study this BSc (Hons) programme but lack the formal entry requirements or feel you are not quite ready to embark on a full honours degree right now. The foundation year will cover general concepts in subjects such as programming fundamentals and computational mathematics, together with essential scholarship skills for technologists in areas such as writing reports and giving presentations. Our BSc (Hons) degree delivers an in-depth understanding of computer science, the theoretical field that underpins all software development. This knowledge prepares you for long-term employability and success as a computer programmer of any kind, but applies in particular to the breadth and complexity of computer games development. At the first stage of the honours degree, you will discover the foundations of computer science and software development, learning about computer programming and vital mathematics. In the second stage, you will explore the core topics of computer science that are particularly relevant to games development such as software engineering practices and principles; databases and large-scale data management; algorithms and data structures; and computer graphics. You will also develop employability skills, especially useful if you need to find a work placement after your second year. You can then take an optional work placement which gives you valuable real-world experience and will help to inform your final year of study. In the final year, you can concentrate on advanced topics including systems level programming, code optimisation and low-level development; modern AI techniques and implementations; applying physics to games and simulations; and integrating art and artists into the development process. We encourage and support you to take the optional industrial placement year. This is your opportunity to work alongside other software professionals and to see at first-hand how the knowledge and skills you have learned on the course are put into practice. 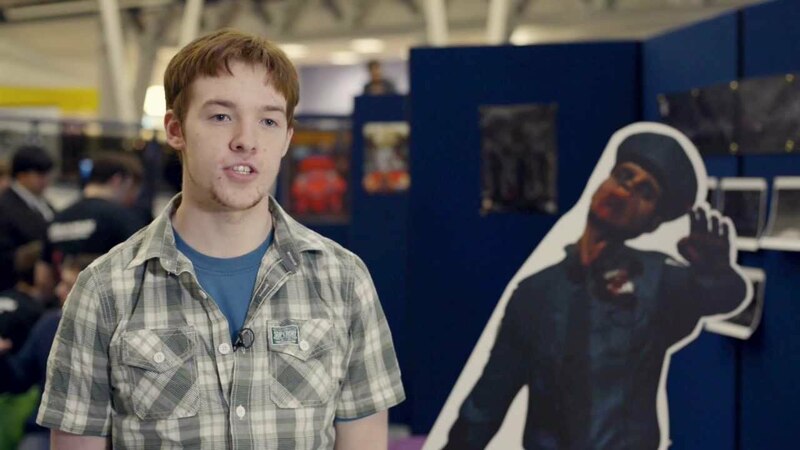 Our students have enjoyed placements at companies such as Kuju, Frontier Developments and Sumo Digital. Through the Independent Studies module, we give you the chance to tailor your studies to match your professional interests and career ambitions. You will develop a large-scale project or conduct a research study into an area of your choice. Previous topics explored by our students include point based rendering, procedural generation of realistic game levels, multi-level AI for elastic difficulty scaling, and many more! "The new Computer Games Programming degree at Derby is harnessing leading-edge technologies such as DirectX and .Net to teach students the fundamentals, coupled with tried and tested games development techniques and languages used in industry. We believe students graduating will have a solid background in games programming and general software development and will be very successful in their future careers." You will study three modules per semester, each delivered through a mixture of lectures, tutorials and laboratory work. We also provide a considerable amount of e-learning support material. Class contact time varies from 10 to 15 hours per week, depending on the level you are studying at. You can choose to spend the third year on an optional supervised work placement. In the first and second stages, assessment is largely by coursework exercises and the formal examined component increases in the final year. You will undertake a mixture of group and individual assignments and 25% of the final year is assessed through a personal project. Skilled games programmers will discover a wide variety of career opportunities everywhere from small start-up companies to major multinational organisations. This course represents the ideal preparation for roles such as gameplay programmer, tools developer and AI programmer. You might even want to start your own company after graduating. Because the BSc (Hons) Computer Games Programming has such a solid computing and software engineering focus, it also opens up excellent prospects for our graduates across all software development roles in the computing industry.